Charlene Mires. 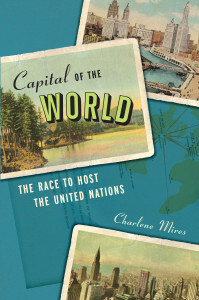 Capital of the World: The Race to Host the United Nations. New York: New York University Press, 2013. Pp. 328. ISBN: 9780814707944. $30.00 cloth, $25.00 paper. There was a moment, seventy years ago, when the world’s hopes for peace centered on northern Nassau County. Before the United Nations (UN) took up residence along the banks of New York’s East River, the UN met for several years in a former defense plant in Lake Success, New York. 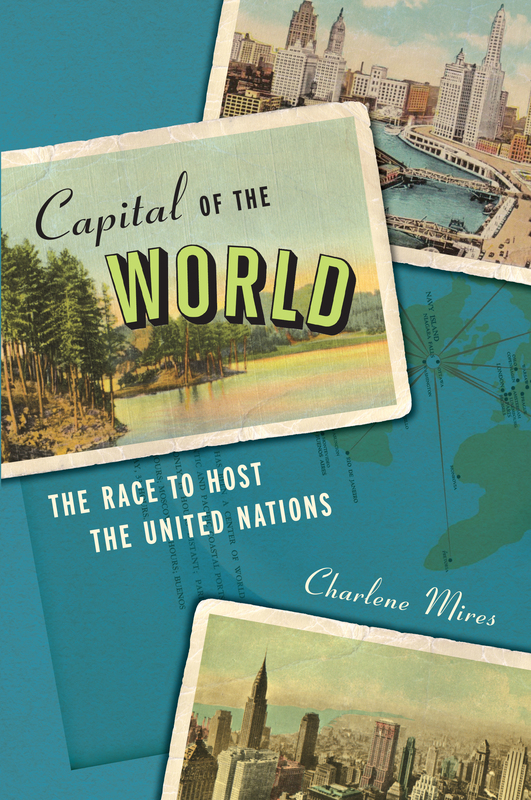 In Capital of the World, a compelling new history of the decision where to place the United Nations headquarters, Charlene Mires offers a rich account of the institution’s early years and connects the UN to urban and suburban America at the end of the Second World War. Everyone knew the new international body would not be headquartered in Geneva, home of the discredited League of Nations. But where would it go instead? Mires traces the upwell of nearly 250 proposals, which arrived at the UN from across the United States “with no invitation whatsoever from the United Nations.”  From Long Island, the towns of Brookhaven, Huntington, Southampton, and Westhampton pitched proposals; individual advocates also suggested Montauk or Center Island. To Mires, these spontaneous and enthusiastic proposals to host the UN demonstrates the popularity of global governance in 1945, a fact many would find hard to imagine today. Becoming the “capital of the world” was a matter of civic pride, and, she notes, “a mouthwatering business proposition.”  But “the perspectives and cultures of boosterism and diplomacy were fundamentally at odds” ; officials ignored most of the proposals and set out to choose their own location. By the time the UN began meeting in New York in early 1946, the organization still had no permanent home. Bronx borough president James Lyons offered the campus of Hunter College, which did not much impress the Security Council. (The absence of air conditioning didn’t help.) New York City Parks Commissioner Robert Moses desperately wanted the UN to take over the former site of the 1939 World’s Fair in Flushing Meadows. But UN diplomats weren’t won over by that possibility, either. The selection committee’s members found Queens “totally lacking in scenic beauty”  and its chair deemed Flushing Meadows “clearly impossible”  as the final site. While Robert Moses fumed and schemed, and the General Assembly grudgingly convened at Flushing Meadows, the UN Secretariat—the organization’s permanent office staff—set up shop in Lake Success, then a small town of just 700 people. There was air conditioning, at least, and limousine service, but the diplomats remained skeptical; many delegations kept a second set of offices in Manhattan. Lake Success was probably never in the running as a final location, but by late 1946, it wasn’t clear that any site could meet the UN’s needs. The solution came like a bolt from the blue. New York developer William Zeckendorf—who wanted to unload an $8.5 million property on the East River—convinced Nelson Rockefeller to ask his father, John D. Rockefeller, Jr., to cover the costs. Junior, fearful that UN headquarters in upper Westchester (then the leading contender) would destroy the bucolic surroundings of his family’s estates, ponied up instantly. Robert Moses gave up his grand visions for Flushing Meadows, until a second World’s Fair—and the Mets—came to Queens. Capital of the World is a wonderfully written book, with compelling personalities and a clear narrative. In less capable hands, the story wouldn’t have come out so well: Mires masterfully turns the minutes of tedious committee meetings into a vivid history. She also embeds the UN firmly in the history of postwar New York; her linkages between the UN’s history and that of suburbia are first-rate. At times, though, she also reads the UN’s early history for signs of the institution’s later challenges, as when she suggests that the UN’s cumbersome site selection process “signaled the difficulties that lay ahead for UN decision making,”  or observing that choosing a headquarters site “tapped into one of the most contentious issues confronting the new international organization—the issue of sovereignty.”  These are more like gestures than a developed line of argument, and not entirely satisfying. Capital of the World leaves off in 1946, but Lake Success continued to serve the Secretariat until the UN’s Manhattan headquarters opened in 1953. An office park and fitness center now occupy the site, and only a few Long Islanders know of this chapter of history. The full story of the UN’s sojourn on Long Island remains to be told, but Capital of the World will remain the starting point for all future research on the topic.